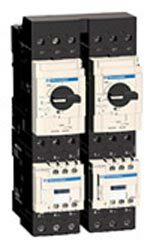 Schneider Electric of Palatine, Ill., has introduced the latest additions to its range of motor control products with TeSys® D 40A, 50A and 65A contactors featuring Everlink® termination technology. “Schneider Electric’s Everlink technology is exclusive to TeSys D 40A, 50A and 65A contactors and TeSys GV3P 40A and 65A manual motor protectors,” said Tim Roberts, Schneider Electric staff product specialist. Everlink termination technology saves time by providing a direct connection to TeSys D overload relays and TeSys GV3P manual motor protectors without requiring an interconnect block. Everlink technology also reduces wiring errors with direct connections. Spring termination technology moves with the wire as it relaxes over time to reduce the need to retighten.